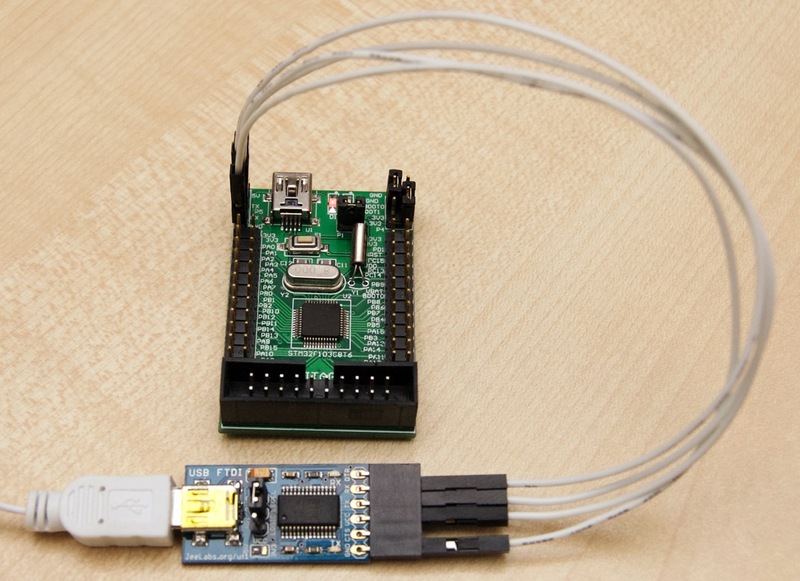 Let’s upload some code onto a new STM32 µC board (or one with unknown / incorrect code on it). As should be clear by now, there’s no other way with STM32F103 chips than to either use STM’s serial ROM boot, or SWD. Our blank chip is too dumb for anything else. The purpose of this exercise is to prepare our board for use – not to go through these steps every time. Once done, it will be running the secondary boot loader we just installed on it. Since this boot loader in stored in flash memory, it will then run whenever the µC is reset. It uses 4 pins, from top to bottom on the FTDI board: RX, TX, +5V, GND. Connect these to the target as needed (those boards all differ), but make sure to cross the RX and TX lines, i.e. what the FTDI sends must be received by the target, and vice versa. This example uploads a small dummy file to keep the output short. Last step: change the BOOT0 jumper back to “1”, and press RESET once more. That’s it! As it so happens, the pinout on this board turned out to be just right for the ST-Link clone used in this setup. Usually, you’ll need wires. The wires are, top to bottom: GND, SWCLK, SWDIO, +3.3V. Note that this example connects 3.3V, not 5V to the board’s regulator. … Flash written and verified! jolly good! Friendly chap, eh? As you can see, this is a somewhat larger µC variant of the STM32F103. For other SWD-capable JTAG programmers, there’s usually a solution via openocd. This uses a 0.05″ header and 10-pin ribbon cable, as common with some of the newer ARM boards. The 4-pin serial port pass-through is not used here. Since the official BMP does not power the target board (it only measures its voltage), a second USB is needed for the +5V. The same notes apply as for the ST-Link: usually, there is no need to adjust the BOOT0 / BOOT1 pins – unless the current running code disables the SWD interface. Note that another way to force control with SWD, is to keep the RESET button pressed during the whole session. SWD, and uploading will work in this mode – while the µC is kept in reset. Transfer rate: 14 KB/sec, 829 bytes/write. Tip: you can use this conversion trick to convert a .bin to a .elf file which gdb will accept. 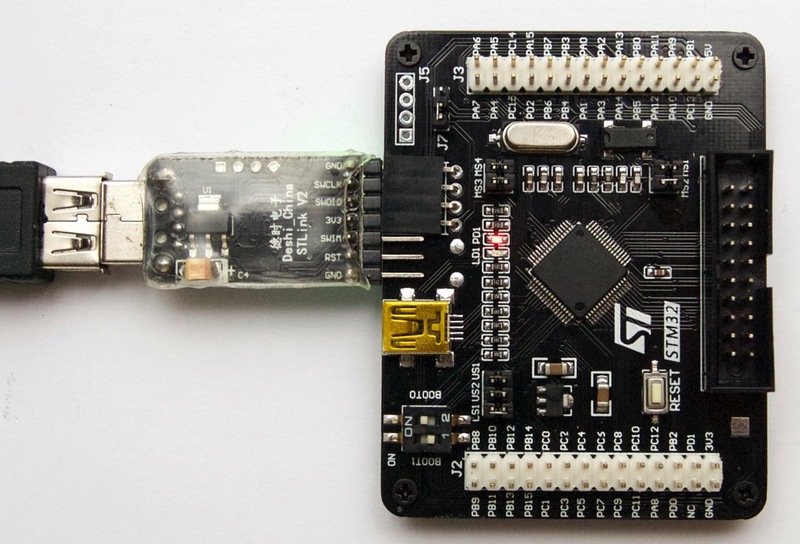 MBED enabled boards have an ST-Link built-in – use the same code as mentioned earlier. What you see here is an extra board on top, with a header matching the HY-TinySTM103T board. Doing this for boards which you intend to use a lot is highly recommended – it’s just one less detail to keep checking whenever you grab this tool to fix a broken setup. Note that to get something loaded onto a blank STM32 µC, you always need something like one of the setups described so far. It’s the chicken vs the egg problem in its full glory. But what if you don’t have any of the above, properly working and ready to go? Well, there is also another option if you have a working Arduino, JeeNode, or other IDE-compatible board. You can turn one of those boards into a temporary STM32 uploader! A 2005-era board updating one from 2015 – how’s that for a “flash from the past”, eh? With openocd, there are many other ways to set up a JTAG / SWD programmer. For an interesting approach, see this page, which uses 6 pins on a Raspberry Pi’s (or compatible) expansion header. The gdb debugger can then connect to it via the network. Neat, huh? Or, the more traditional approach: build OpenOCD on the Raspberry Pi and plug in one of the many supported ready-made JTAG adapters via USB. Again, reachable via the network. 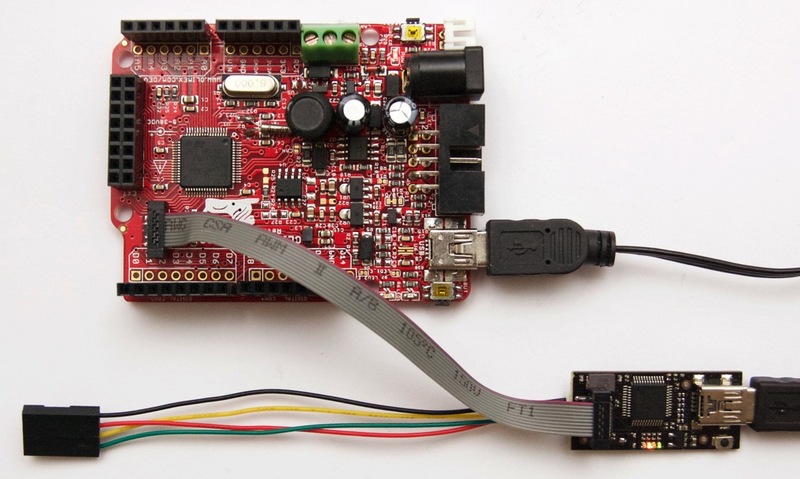 This concludes another essential summary of things needed to get going with STM32 µCs. We still need to decide what boot loader to install using any of the above methods, but that’s beyond the scope of this article. The key is that with a boot loader of our choosing installed, we can finally start to use these STM32 µC boards.